Or, what to eat after an incredibly indulgent vacation but the idea of plain chicken and broccoli makes you sad. If you follow me on Instagram, you may have noticed I was on the West Coast last week. The short version of that story is that San Fransisco and Napa were awesome. The long version full of details about where we stayed, what we did and most importantly, what we ate & drank is coming very soon. In the meantime, I thought I could at least share something helpful. 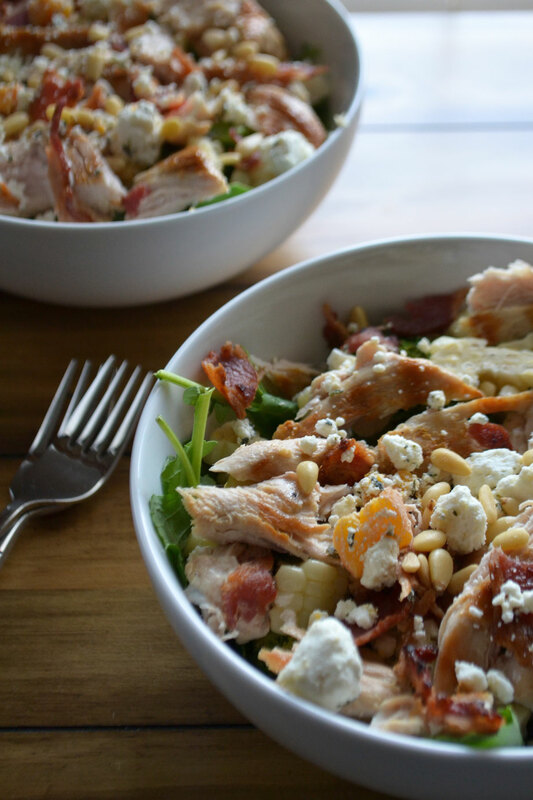 If you too are coming off a vacation high, or trying get back into a more healthful routine now that the season of s'mores and ice cream cones are coming to an end, then these chicken, bacon, cheese and green bowls can help. When you top green things with chicken, a little bacon & some goat cheese you can definitely pretend you're not eating a salad. Place a large handful or two of spinach in two bowls. Top each bowl with 1 sliced chicken breast, 1 cup roasted broccoli, 1 slice of chopped bacon, and a nice sprinkle of goat cheese and pine nuts. Top with the dressing of your choice. I was good with just a little drizzle of olive oil, there's a lot of flavor in this salad.